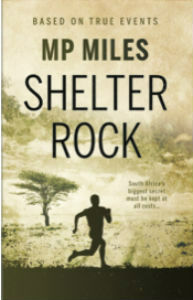 SHELTER Rock is a newly published spy thriller by North Dorset born debut author MP Miles, set in apartheid-era South Africa. The story follows an African spy and a secretive youth as they retrace the author’s own steps in a dramatic pursuit through Africa. Like most authors, MP Miles was advised to write from what he knew. So Shelter Rock draws on his experiences as someone who worked on an irregular basis with British intelligence, walked home alone as a teenager from South Africa to the UK and was rescued at gunpoint by a man who reappeared later in Miles’ life under a different name. South Africa is under attack from all sides when Elanza, a politically connected heiress blinded by disease and looking for love, meets naïve Englishman Ralph who realises he’s stumbled upon South Africa’s biggest secret. When Ralph disappears into the darkest part of the continent to walk home overland, a Swazi spy, the only black African agent working for the apartheid era National Intelligence Service, comes into both of their lives. Angel Rots is uniquely qualified for his official mission to find Ralph and a private mission to settle an old score, but in a pursuit from Cape Town to Cairo, Ralph is always one step ahead and Angel starts to ask questions. Why is this kid so important? What has he found? Looking for answers, Angel discovers a secret that challenges his own loyalties – and could change the course of history. Hearing the rhetoric from North Korea and the US in recent years which “sounded very much like cold-war nuclear brinkmanship,” he believes there are parallels and similarities between North Korea’s position today and South Africa’s nuclear ambitions in the 1980s and early 90s leading up to the end of apartheid. MP Miles is originally from a small town in Dorset. He is a pilot, diving instructor and chef. A lifelong sailor he lives in the Caribbean with his girlfriend on-board a yacht called Pacific Wave. Shelter Rock was published by Troubador Publishing Ltd at the end of February. Posted in Words! Words! Words! on 7 March, 2019 .